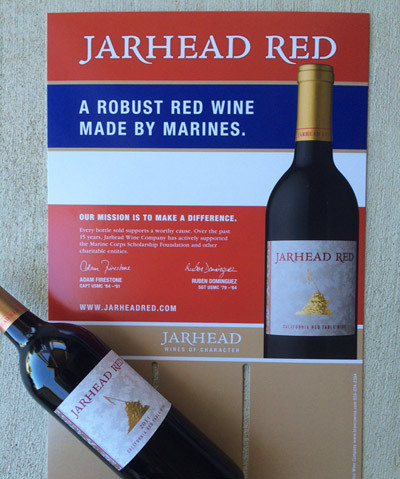 Here’s something to keep an eye out for at your neighborhood market or wine shop: the new Jarhead Red display card, hot off the presses this week. 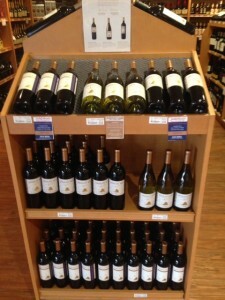 Known in the trade as a “case card,” it is designed to slot upright into wine case boxes for in-store display. We kept the main message simple: “A robust red wine made by Marines.” No need to get fancy about it, right? The card also lets people know that every bottle supports a worthy cause, with net proceeds of all sales going to USMC-based charities, primarily the Marine Corps Scholarship Foundation. We wanted the design of the case card to be bold yet elegant, just like the wine. We hope you agree that it hits the mark. In addition to being an iconic Marine Corps Base, Camp Pendleton in California’s San Diego County is home to many Marines who support Jarhead Red. Indeed, the base is home to several stores that stock our wines, including Beverages, Etc., Seaside Square and Vineyard West. “Vineyard West is a gorgeous store, it’s something that would fit just fine in Napa Valley,” says John Bagley, the Classic Wines of California sales representative who represents Jarhead Wine Company on the base. 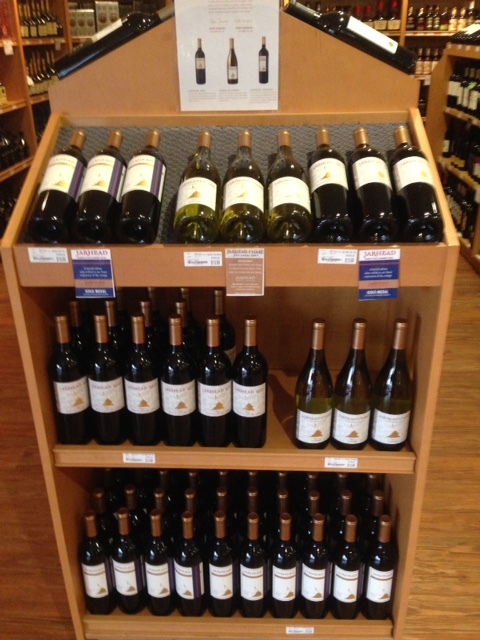 Pictured above is a Jarhead endcap display at Vineyard West. At these stores and others, John finds that buyers and customers alike are intrigued by the Jarhead story, most notably our Marine-centric mission and history. If you’re ever at Camp Pendleton, keep an eye out for John at one of Vineyard West’s tastings that run from 5 p.m. to 7 p.m. on Thursdays and Fridays. “I periodically pour Jarhead wines at Vineyard West’s tastings, and it’s an honor to share them with the U.S. Marines there on the base,” he says.